Switzerland’s central bank has the legal status of a corporation, with the majority of shares held by cantons and cantonal banks. There are also some 2,000 private investors, who receive a dividend but whose voting rights are extremely limited. It is the annual result that determines the payout to the government and the shareholders. In the first quarter, the franc appreciated 15 percent against the euro, 2 percent against the dollar and by a similar amount against the yen. The stronger franc means the foreign currencies are less valuable in Swiss terms. 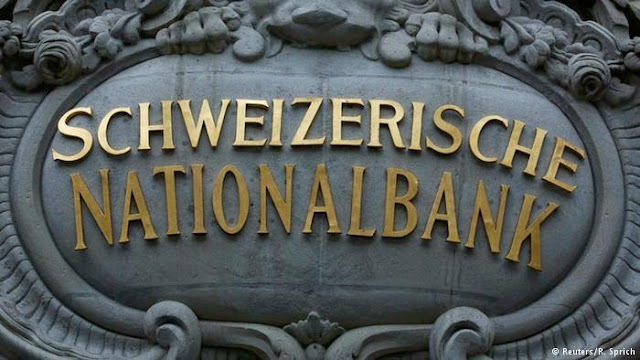 In the first quarter, the SNB earned 236 million francs from the negative interest rate charged on sight deposits, which is the cash commercial banks hold with the central bank. In a bid to widen the interest-rate differential with the euro area and make holding franc-denominated assets unattractive, the SNB cut the deposit rate to minus 0.75 percent in January. The SNB holds about half a trillion dollars in foreign- currency reserves, much of which has been accrued in recent years due to interventions to weaken the franc and defend a minimum exchange rate. Some 42 percent of such reserves were held in euros at the end of March, compared with 46 percent in the prior quarter, according to data published separately on the SNB’s website. The allocations for dollars increased to 32 percent from 29 percent. Much of the reserves are held in highly rated government bonds. The proportion of equities increased to 18 percent from 15 percent.